Cross cut taper fissure burs are ideal for sectioning teeth. The canine bur kit comes with an assortment of 10 FG burs 19mm long in an aluminium autoclavable holder. The selected burs meet the various requirements of a veterinary clinic and are used in the high speed handpiece. Bur images and reorder codes are printed on the bur holder. Made in the USA. Standard length FG round burs are suitable for removing bone, creating access openings, drilling holes and crown reduction in teeth. Standard length FG round burs are suitable for removing bone, creating access openings, drilling holes and crown reduction in small teeth. Standard length FG round burs are suitable for removing bone, creating access openings, drilling holes and crown reduction in small to medium teeth. 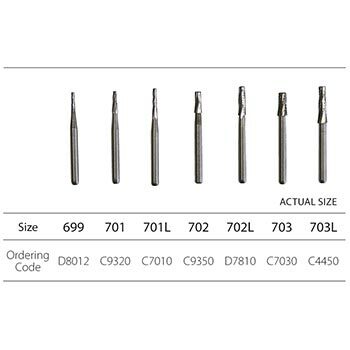 Standard length FG round burs are suitable for removing bone, creating access openings, drilling holes and crown reduction in medium to large teeth.